DVD Ripper for Mac is the most powerful, all-in-one DVD ripping software that designed for Mac users. This best Mac DVD ripping software can help you rip DVD to various video formats (including MP4, AVI, M4V, MOV, 3GP, MPG, FLV) and audio formats (MP3, M4A, AAC, WAV, OGG, APE, etc.) so you can put DVD on iPhone/Zune/PSP/Apple TV and other devices you like. Aimersoft DVD Ripper for Mac provides you a series of powerful functions. The best Mac DVD Ripping Program can copy all of your DVD movies by 1:1 perfect Video & Audio quality. You can select the chapter/subtitle and audio track you want, trim any subtitle, cut off the black edge of the movie and merge more than one DVD chapter into one. Although this Mac DVD Ripper software is very powerful, it is still easy to use. You can finish converting DVD to AVI or other formats with just a few clicks. Now download Aimersoft DVD Ripper for Mac for free and enjoy your DVD movie without limitation of DVD disc. Perfectly compatible with All Mac OS X. Copy DVD movie by 1:1 with perfect Video & Audio Quality – better than any other DVD Ripping software. Convert DVD to all common video and audio formats including MP4, AVI, M4V, MOV, 3GP, MPG, FLV and audio formats including MP3, M4A, AAC, WAV, OGG, APE, MP3, WMA, AAC, etc. Support all sorts of mobile players. Aimersoft DVD Ripper for Mac helps you rip DVD to video and audio formats that can be played on iPod touch/Nano/Classic/Video, iPhone, Apple TV, PSP, PS3, Youtube (web), Creative Zen, iRiver PMP, Archos, all kinds of video cell phones and digital video and audio players. Allows you to select target chapter and audio track. 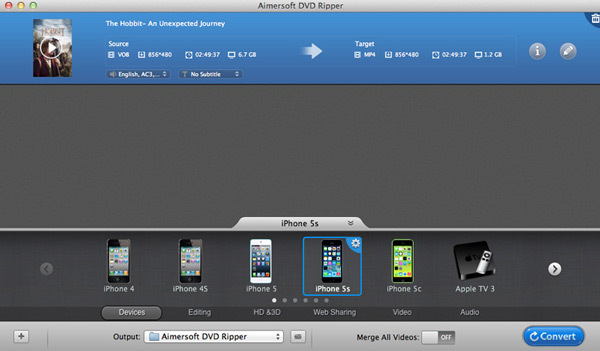 Aimersoft DVD Ripper for Mac provides you powerful video editing functions. You can trim excrescent or special parts of movies, cut off the black edges, adjust brightness, contrast, audio, etc. Merge several files into one, and you can also rip the chapter you want.